NAM COMMENCES 2017 EXPLORATION PROGRAM AT THE RIVER VALLEY PGM PROJECT, SUDBURY MINING DISTRICT – New Age Metals Inc. Signed contract with Abitibi Geophysics to commence surface geophysical program. River Valley is the Largest Undeveloped Primary PGM resource in Canada, with 2.5 Moz PGM, in Measured Plus Indicated mineral resources and near-surface covering over 16kms of strike. Upon completion of the geophysical program, drilling slated for summer 2017. MAY 10, 2017 Vancouver, Canada – New Age Metals Inc. (TSXV: NAM; OTCQB: PAWEF; FSE: P7J.F) is pleased to announce that the Company plans to commence its 2017 Exploration Program this spring with a surface geophysical program at the Pine Zone of the River Valley platinum group metal (PGM) deposit near Sudbury, Ontario (Figure 1). The Pine Zone is one of many PGM zones within the district-scale River Valley PGM Project and was most recently drilled in the fall of 2016 (see to press release dated December 13, 2016). The 2016 drill program confirmed the higher-grade, near-surface PGM discovery made previously in the 2015 drill program (see press release dated March 11, 2015) and highlighted the continuity of the mineralization for 200 metres along strike and 100-200 metres depth. The Pine Zone remains open along strike and at depth. The surface geophysical survey will be performed to test the potential for eastwards and southwards extension of the Pine Zone and aid generation of new targets for drill testing later in 2017. The 2017 Exploration Program will begin in May-June with cutting of a line grid for the surface geophysical induced polarization (IP) survey. The IP survey itself will consist in part of a detailed orientation survey to record geophysical responses over known geologic features and higher-grade PGM mineralization located in the Pine Zone and the adjacent Dana North Zone (Figure 2). The orientation survey will produce a geophysical fingerprint, which can be used to target favorable geologic features and potentially identify additional blind, structurally controlled PGM mineralization to the east, down-dip and up-dip of the Pine Zone, and elsewhere at River Valley for drill testing. Approximately 2 km of untested potential for discovery of additional mineralization presently exists along strike between the current drilled extent of the Pine Zone and the under explored Pardo Zone to the northwest (Figure 2). The geophysical survey will be a high-resolution OreVision® IP survey performed by Abitibi Geophysics (Thunder Bay, Ontario). OreVision IP can reveal targets at four times the depth of conventional IP without compromising near-surface resolution. The survey size will be 20 line-km over an area measuring 1.1 sq km (Figure 3). The survey will be performed along NW-SE trending, 50m to 100m spaced cut-lines across the apparent strike direction of the geological features controlling the Pine Zone. The depth of investigation is planned to be 440m, which is 40m below the maximum predicted depth of the Pine Zone in this area. In addition to the OreVision® IP survey, Abitibi Geophysics will also survey two open drill holes through the host geology and PGM mineralization for physical property measurements. The physical property data will benefit 3D inversion and modelling of the OreVision® survey dataset, thereby aiding generation of high priority targets for drill testing. Target generation will be followed by a ~5000 metre drill program in the summer or fall of 2017. In 2016, the company acquired the River Valley extension property which added approximately 4kms to the project mineralized strike length. 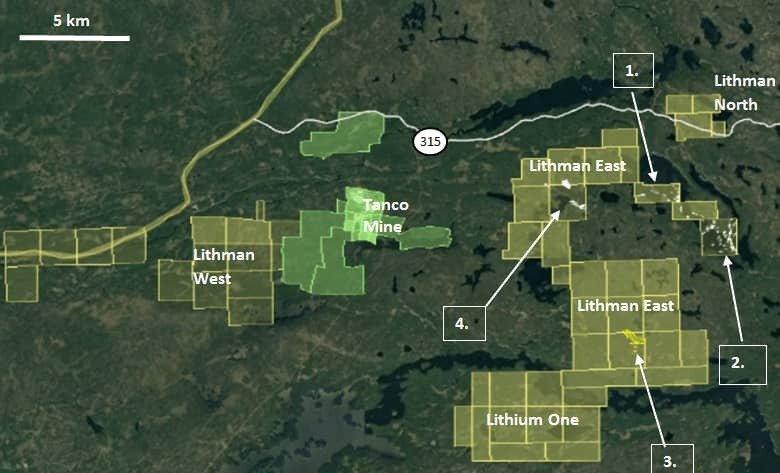 To date the Company has acquired 5 hard rock (Pegmatite) Lithium Projects, in the Winnipeg River Pegmatite Field, in SE Manitoba. This Pegmatite Field hosts the giant Tanco Pegmatite that has been mined for Tantalum, Cesium and Spodumene (one of the primary Lithium ore minerals) in varying capacities, since 1969. Today, the Tanco Mine is focused on the mining of Pollucite (primary Cesium ore) and the production of Cesium Formate, a completion drilling fluid for the petroleum industry. NAM’s Lithium Projects are strategically situated in this prolific Pegmatite Field. Presently, NAM is the largest mineral claim holder in the Winnipeg River Pegmatite Field and is seeking JV partners to further develop the company’s Li division. The Company also announces that it has issued an aggregate of 287,954 common shares to Agora Internet Relations Corp. (“AGORACOM”). The securities issued represent the payment for services under the terms of an existing agreement and are subject to a four month plus one day hold period expiring September 3, 2017.